I am participating in a 30 week block of the week program. We're about 1/3 of the way through and finally an applique block appears. I don't dislike doing applique, it's the prep work I find tedious. So please tell me your favorite way to get perfect 2.5" diameter circles done. I really don't want to fuse them. Thank you! "Kindness is the oil that smooths the frictions in life"
I like to use a used dryer sheet and I draw my circle on it. I lay the dryer sheet on the right side of my fabric and sew with a smaller stitch length all the way around the circle. I trim the edge with my pinking shears down to 1/4 inch seam allowance. I cut a slit in the center of the dryer sheet and turn the circle right side out. I press with the iron until the circle is perfect. The circle is now ready to appliqué down. I found the Perfect Circles on Amazon! Created by Karen Kay Buckley and also available on her website. Yes! These are the ones! She had them in two sizes. The package you linked is the smaller ones and here is the Amazon link for the bigger ones. I make my own circles from the template plastic which is heat resistant, meaning you can iron over it. Trace the circle the size you want, cut it out--remembering to turn the plastic into the scissors while cutting to get a smooth edge. Then feel the edge of the circle for any tiny bumps or roughness and smooth those with an emery board, and you're good to go! I have a circle template thing with all different sizes of circle holes cut out of it which I often use for tracing. It's available wherever school supplies, etc. are sold. I also will trace around coins or buttons, etc. if they are the size I need. Once you have your plastic circle ready, trace around it on the wrong side of the fabric and cut it out leaving yourself about 3/8 of an inch seam allowance. Stitch a running stitch all around in that seam allowance, and overlap the stitches a bit at the starting point. Put the heat resistant plastic circle against the wrong side of the fabric and use the thread tails to gather up the seam allowance around it like a shower cap. Press it crisp with some spray starch on both sides while the heat resistant plastic is still inside. After it cools, loosen the gathered seam allowance a bit right at the starting point of your running stitches and pull out the template plastic. Now use the thread tails to again pull that gathered seam allowance tight and the applique circle is perfect again and will easily applique down, keeping that perfect shape. I use Tartan's method with the old dryer sheets (I even have friends save them for me). So simple and a perfect circle every time. Non fusible non woven interfacing works like dryer sheets too. I have done circles that way and also making my own as mentioned above and both work well....save the money u would spend buying templates, when you can do it with what you already have on hand! I would never use dryer sheets because of the added fragrance and other chemicals, but I have used interfacing, sewn on the right side, clip the edges, clip the interfacing, turn, straighten out the circle from the inside, and then you have a perfect circle. You can use regular or iron on interfacing, if using the iron on, the sticky side goes toward the right side of the fabric, then, once turned, it can be ironed onto the fabric. If you want less bulk you can cut away most of the interfacing after turning the circle. I didn't want to pay the price for the "perfect circles" when I had what I need in my desk drawer for years. Remember the compass we use that had the pencil in it to make arcs and circles. They still sell them at places like Office Depot. They're about $7-8.00. The one I have makes up to a 12" circle. You can make your own circle templates with this. I now keep mine in my template. you can also make scallops with this so easy. Also any size yo yo you want. Like feline fanatic, I use a compass to draw my circle on cereal box cardboard and then cut it out with scissors. I cut the fabric using the cardboard template and adding a seam allowance. I then lay the template in the center of the fabric circle and give it a good spray of starch so the seam allowance gets wet. Then I press the seam allowance up and over the edges of the template until they're dry. Perfect circles every time with no starch on the front of the circle. Here's one result. 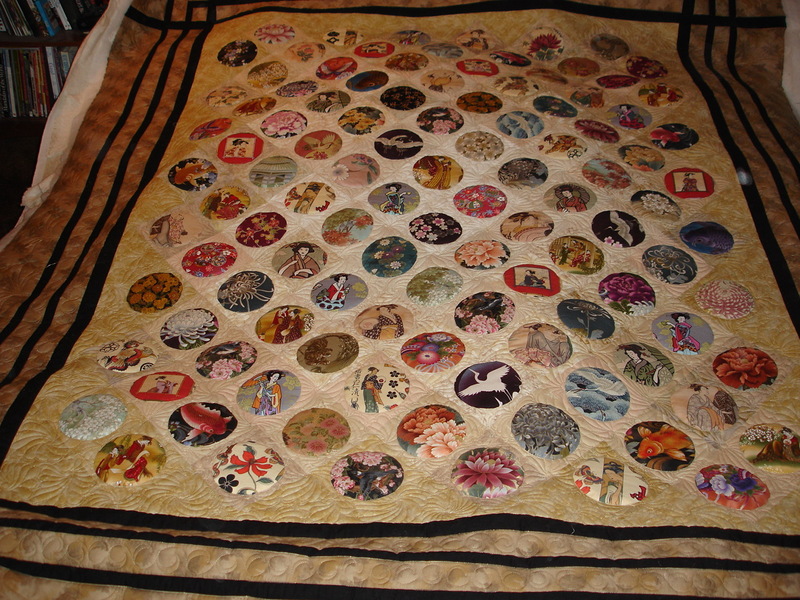 The smaller circles are appliqué, the large ones are pieced. Ghostrider your circle quilt is exquisite! What a fabulous study in hue and color gradation. Feline Fanatics and Ghost: what fabulous quilts! I love them. Feline fanatic and Ghost rider, your quilts are gorgeous! Last night I cut out some templates from freezer paper and made a few circles which turned out ok. Probably should have used some light cardboard but I was surprised I could gather the fabric around the paper. Tonight I made more using the Perfect Circles. My LQS had them and they worked well, too - probably a little faster than the paper. Next will be the interfacing method. I need to see if I can sew a circle. :-) Thanks again everybody. GR. that is one beauty of a quilt. For larger ones I kind of use Tartans method. I use stabilizer instead of dryer sheets and i put water soluble thread in my spool holder and regular thread in my bobbin and stitch a closed circle, then trim, slit, turn right side out, carefully with a DRY iron set your shape, then turn on the steam and blast...then pick out your bobbin thread and remove your stabilizer or dryer sheet. NOTE: don't forget to mark this thread and keep it seperate from your sewing threads...I have heard of people making a mistake and using the water soluble thread for peicing. then they finish their projects, wash them and oh what a mess. I have these perfect circles....bought when I took a class from Kay. I personally would not recommend them. The first time you use them....as directed....they become warped and are not as nice to use! Pretty expensive for one time use. Wow, wow, WOW! This is my dream quilt....I have been thinking about making something that would look just like this! I love Asian fabrics AND circles! Thanks for the inspiration!